RSM Federal, a nationally recognized coaching and advisory firm for government contractors, is pleased to announce a strategic partnership with GovPurchase; a subsidiary of National Bid Network (NBN). This new partnership integrates the GovPurchase market intelligence platform with Federal Access, RSM Federal’s advanced education and training platform for government contractors. The two platforms have been integrated as a joint solution. “This partnership combines the power of being able to quickly and easily identify and bid on government opportunities – combined with proven techniques, strategies, and expert advice on how to win those opportunities. There are no contract management systems on the market today that provide step-by-step instruction, and the processes, techniques and strategies required to rapidly accelerate a company’s federal revenue stream. This is the first end-to-end solution that provides 100% of what companies need to successfully navigate the market and win more contracts.” – Stated Joshua Frank, Founder & Managing Partner of RSM Federal. GovPurchase pulls, sorts, and organizes data from over one million government contracts per year from more than six thousand state, local, and federal government database sources; making it the most comprehensive and cost effective market intelligence platform on the market today. In addition to government contracts, the GovPurchase platform also contains vital company information on over 900,000 contractors that focus on the federal market. “Our clients use GovPurchase to find out which agencies and organizations buy what they sell, how much, and how often. Our expiring contracts feature also allows our users to find and engage opportunities before they are officially released to the public. These capabilities create an advantage for GovPurchase users that has allowed them to win over 15 billion in government contracts in 2015. With the addition of the Federal Access platform, our clients have the most comprehensive and proven total solution on the market.” – Stated Kim Harwell, a National Procurement Manager at GovPurchase. The Federal Access platform coaches its users on proven techniques, strategies, and processes they need in order to win more opportunities that they find through GovPurchase. 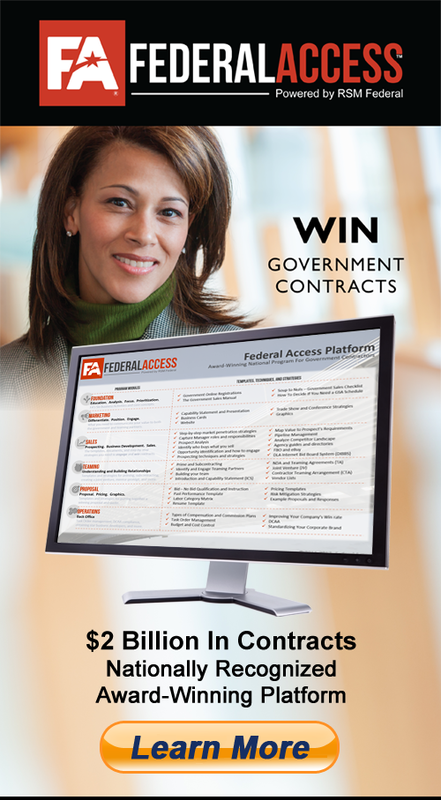 The Federal Access platform comes with a complete digital and proposal library with over a hundred critical documents, templates, and real world examples as well as an on-demand video training library, monthly webinar training sessions, and access to government contracting subject matter experts. 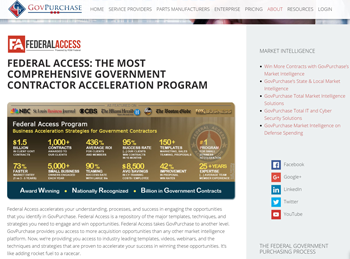 “By themselves, GovPurchase and Federal Access are industry leading solutions for their users. However, the combined solution of both services is literally a dream come true for many government contractors. There is no other partnership or joint solution that matches the level of data and intelligence along with the precise action steps of what to do with that information on the market. This solution will allow thousands of existing government contractors to win more contracts and it will enable new companies to enter this market and win contracts in 6 to 12 months versus the average company that takes 3 to 5 years to win their first contract. This is truly a game changer for government contractors.” – Stated Michael LeJeune, Partner & Federal Access Program Manager. 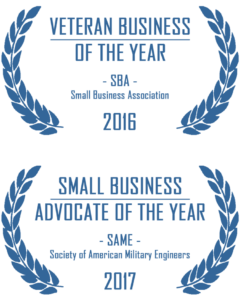 GovPurchase is one of National Bid Network’s family of companies and was founded by a group of former government and military employees, government lobbyist, and contractors. The GovPurchase platform is a premier market intelligence tool used by more than 8,000 companies to help find and win government contracts.